All of these stages have different requirements and user groups. Template designers are typically trained to use a template design application. But what if any business unit would be able to modify templates only with MS Word skills? The Text Control Reporting Framework provides sophisticated components for all of these stages. Not being dependent on an additional third-party tool such as MS Word to create templates is a very important key aspect when implementing reporting functionality into business applications. All reporting processes should be completely integrated into the application to guarantee the best possible user experience. Only with fully integrated solutions, applications can be adapted to the user expectations and requirements. If MS Word is required to create templates, the Merging process must support all different MS Word versions. If the Designing process is realized with MS Word plug-ins, various MS Word versions need to be supported and such applications cannot be completely customized. A data source can be any IEnumerable object (business objects), JSON objects, DataSet and DataTable objects. TX Text Control follows the concept of pre-shaped data where data queries are executed before data is passed to the merge process. TX Text Control is using the data and its order and logic as is in order to create the resulting documents. The advantage of this concept is the separation of content and logic. 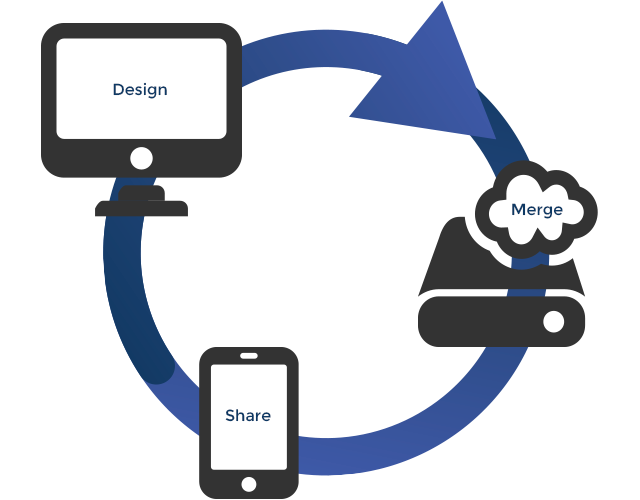 Users of applications built with TX Text Control enjoy an easy-to-use interface and a simplified concept of inserting merge fields and merge blocks into templates. Complex logic is not part of the template, but part of a separate business layer in your application that creates the data object. This concept helps to simplify the template creation process and to allow non-technical business units to maintain templates instead of binding developer resources. Test this all on your own and download a trial version of TX Text Control .NET Server for ASP.NET.